This section needs a lot of work. Please contribute if you can. Check this page to see if there are some suggestions for adding to Mono. 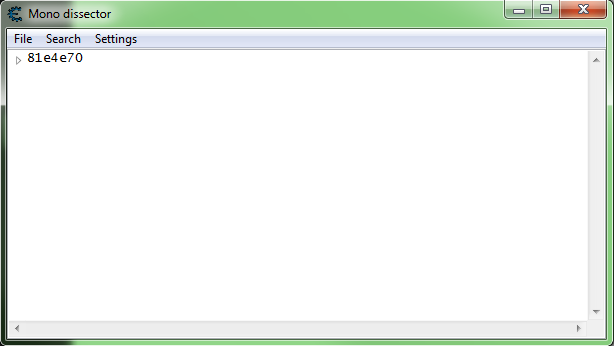 If you attach to a process/game that uses mono, you should see a new "Mono" menu item on the Cheat Engine form. This will have an Activate mono features menu item and a Dissect mono menu item. Activate mono features will inject the appropriate DLL for the Mono Data Collector (located in the autorun folder) and set up a pipe to communicate with it. If the Mono features are enabled then the menu item will be checked. If there is an error enabling the Mono features you will get a message like this. Dissect Mono will open the Mono Dissector form which lets you browse the mono classes available. Mono is a free and open-source project. Led by Xamarin, a subsidiary of Microsoft (formerly by Novell and originally by Ximian), and the .NET Foundation. Created to build an ECMA (European Computer Manufacturers Association) standard-compliant .NET Framework compatible set of tools. Including a C# compiler and a Common Language Runtime with just-in-time (JIT) compilation. Side Note: The logo of Mono is a stylized monkey's face, mono being Spanish for monkey. Just-in-time (JIT) compilation (a.k.a. : dynamic translation or run-time compilation), involves compilation during execution of a program (at run time) rather than prior to execution. JIT compilers also use ahead-of-time compilation (AOT), and interpretation; and combines some advantages and drawbacks of both. This page was last modified on 5 May 2018, at 22:53. This page has been accessed 46,532 times.